We love obstacle course racing at The BTG! The coaching staff and several of our awesome BTG members have taken part in various races over the years, including Tough Mudder, Muderella, and Rugged Maniac, but our favourite brand of OCR madness is the Spartan Race series. 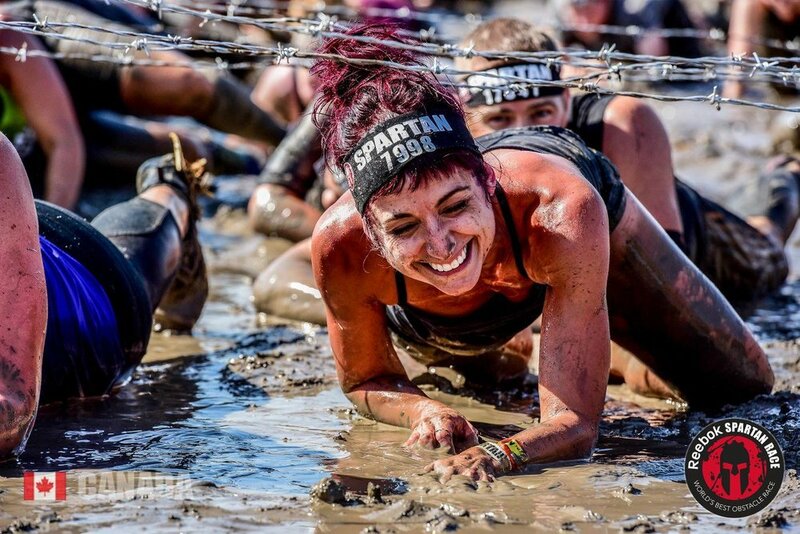 In 2017, Coach JP also became a Spartan SGX certified coach so that he could "officially" share that madness with others. In 2016, Coach JP and three BTG members completed a Spartan Race Trifecta, having finished a race at each of the distances (Sprint, Super and Beast) in one year, including the race where it all started, the Spartan Race Sun Peaks Beast. Coach JP also went on to run a second Beast to finish out the season (and keep a member company while he finished his Trifecta), completing 4 races in 49 days after recovering from breaking his ankle early in the year. In 2017, in addition to the Spartan Race Sprint and Super races in Calgary, Alberta, we had a team of four tackle the most challenging Spartan Race Sun Peaks Beast course we've seen, hitting all three peaks over its 24km+ distance, including a brutal, near-vertical ascent up Mt. Tod that seemed to go on FOREVER! We then had a team of seven running in the Sprint the next day, including three of the four Beast team members. Coach JP and one BTG team member also completed Trifectas at the Sun Peaks weekend to finish off our season. With our teams having completed a combined 550+ km and 1000+ obstacles in Spartan Races over the last three years, we feel like we've got a pretty good handle on what skills and attributes are needed to do well. Whether you race with us at those events, or choose to do others, we invite you to train with us to crush your next Spartan Race, or whatever other obstacle course race challenge you choose to take on! Do you just want to finish, or do you want to finish fast? An important question to consider when planning your training is whether you just want to finish (and not be broken), or whether you want to finish fast (and preferably not be broken either). If you just want to finish, honestly, you could try most obstacle course races without any training...but you'd be doing a LOT of penalty burpees at a Spartan Race! Heck, they've even made the burpees optional for the non-competitive heats. You could just try your best at the obstacles and walk the course, but what's the fun in that? Even if you're not a runner, attacking the obstacles is a lot of fun, but some of them can be pretty physically tough. Spartan Races have a LOT of carrying heavy, awkward stuff over crappy terrain, several obstacles where you have to hang and traverse using only your hands, climb or pull or lift heavy stuff using ropes, and lots of walls to climb over. Not to mention crawling through mud, balancing on beams and logs, and other fun stuff. If you miss/fail at an obstacle, 30 burpees is your reward. While you could do most of those things without training, it's more fun to succeed at the obstacles because you're prepared. If you fail at an obstacle anyway, it's significantly less crappy doing burpees if you're used to them, and you'll get through them much faster. We find that the kind of training that helps us succeed on obstacles at the Spartan Race events also happens to fit really well with the kind of everyday, life-long fitness we aim to help all of our BTG members achieve. Because of that, all of our strength & conditioning training at The BTG is geared towards the same attributes and strengths needed to succeed on obstacles. For those members who are training for events, we add in a few more specific movements / tasks (especially hanging grip challenges) to prepare. We also have periodic "BTG Spartan Team" specific workouts or field trips to help us become stronger as a team, not just as individuals. I want to finish fast! If you want to finish fast, you need to be even better at the obstacles, and you also need to be able to cover uneven ground quickly. On mountainous sites like Sun Peaks, Mt. Seymour or Whistler, that also means being able to handle some serious elevation gain and loss over the course of the race. To finish fast at a challenging, mountainous course, you need to incorporate some stair training, mountain hiking and trail running into your training plan. As with most things fitness related, these things are way more fun when you do them with others, and in the case of anything out on the mountain trails, for safety, you should never be alone anyway. Trail races are also a good way to test your mettle on the trails without having to deal with obstacles along the way. Trail runners also tend to be a lot wackier, laid back folks than the ultra-serious, pounding the pavement road runners, and those personalities really help you along when you're grinding up and down a friggin' mountainside for nothing more than a medal and a T-shirt...LOL! As above, be prepared for the obstacles by taking part in our regular strength & conditioning training sessions, but also add in some stair work, mountain hiking and trail running. Trail races are great prep for the longer Spartan / OCR distances, and are just plain fun on their own too. Details for all of that can be found below. If you're in or near Abbotsford, you can join us at the Auguston Stairs every Saturday morning at 08:00 (or after sunrise through the winter), as long as there is no snow or ice on the ground, and it's not a race weekend. It's a great, free workout, and you'll get to meet Coach JP and the crew from The BTG! This nasty little set of 358 steps gains about 200 feet of elevation on its way up, and we usually aim to complete somewhere around 10 sets in the hour we spend there. Some days, we'll do 5 sets as fast as possible, other days we'll do pyramid style training...it can vary, but most times, plan to be there for an hour if you're training with us. If you're planning to hit the stairs and want to know whether we'll be there, text Coach JP at 778.241.3578 to confirm. If you want to be subtly nagged...I mean "reminded" a few days in advance when we're doing stairs, hiking or trail runs, join our e-mail list by clicking the button below. On many weekends, either after our stair training on Saturdays, or on Sundays instead, we'll hit the trails on nearby McKee Peak or Sumas Mountain. Depending on the group, some days it's an easier-paced hike out to Chadsey Lake (AKA "Lost Lake"), others it's an up and down grind over the FVMBA single-track trails that were used in the Run for Water Trail race. Sometimes, it's a bit of both. We also might be meeting up with the Abbotsford Trail Running Club for their weekly Thursday night runs and other outings from time to time, because RUN VERTICAL is a pretty cool tagline! Seriously, if they're some of the same people we met at the 2016 Run For Water Trail race (and I'm pretty sure they are), they'll be a blast to hang out and train with. I'll be posting all planned outings on our Events page, but as above, text Coach JP at 778.241.3578 to confirm.